​rates of youth mental illness remain stable and high. In the U.S., up to 80% of youths in need of psychological services never receive them. ​Compared to youths who believe personal traits are malleable, those who believe personal traits are fixed experience more academic and self-regulatory distress. Recently, studies have begun to explore relations between beliefs about the malleability of personal traits, or 'mindsets', and youth mental health problems. In a meta-analysis on this topic, we observed that youths who view personal traits and abilities as fixed and unchangeable are more likely to experience a wide variety of mental health problems, and that youth psychopathology predicts increases in maladaptive, fixed mindsets over time. In a randomized-controlled trial supported by the NIMH, the APF, and the Harvard Center on the Developing Child, we found that mindsets may be a promising intervention target: compared to a control program, a 30-minute growth mindset intervention improved physiological stress recovery and perceived control, as well as longer-term anxiety and depressive symptoms, in high-symptom early adolescents. Current and future studies are evaluating predictors of this intervention's effects; longitudinal links between mindsets and mental health in anxious and depressed adolescents, as well as youth on the autism spectrum; alternative delivery systems for enhanced mindsets interventions (e.g., via virtual reality technology, through a collaboration with Limbix VR; details on this clinical trial are available here); subjective, physiological, and neural mechanisms underlying the intervention's effects (e.g. improved perceived control, stress recovery, and approach motivation); and whether a self-administered growth mindset intervention can boost treatment engagement and response in clinic-referred youth beginning change-focused, evidence-based psychotherapy (CBT) for anxiety and depression. Due to logistical, financial, and many other barriers, up to 80% of youths discontinue mental health treatment prematurely, with a sizable number dropping out after just one session. As a result, it is important to understand what it is possible to accomplish through a single "dose" of intervention. In a recent meta-analysis, we evaluated the effects of single-session interventions (SSIs) for youth mental health problems. Across 50 RCTs representing 10,508 youths, SSIs demonstrated a significant beneficial effect--even for self-administered interventions (i.e., those that did not involve a therapist). Practical and public health implications of these results may be considerable: in some cases, SSIs may present a cost-effective alternative or adjunct to traditional youth psychiatric services. ​Ongoing and future projects are exploring the promise of SSIs and other scalable intervention strategies--particularly novel, theoretically-precise approaches harnessing family processes and youth cognitions, using low-cost delivery systems--to help lessen the burden of anxiety and depression in youth. We are soon launching projects testing new strategies of matching youths to mechanism-targeted SSIs based on their personal symptom profiles using an idiographic network analysis approach. 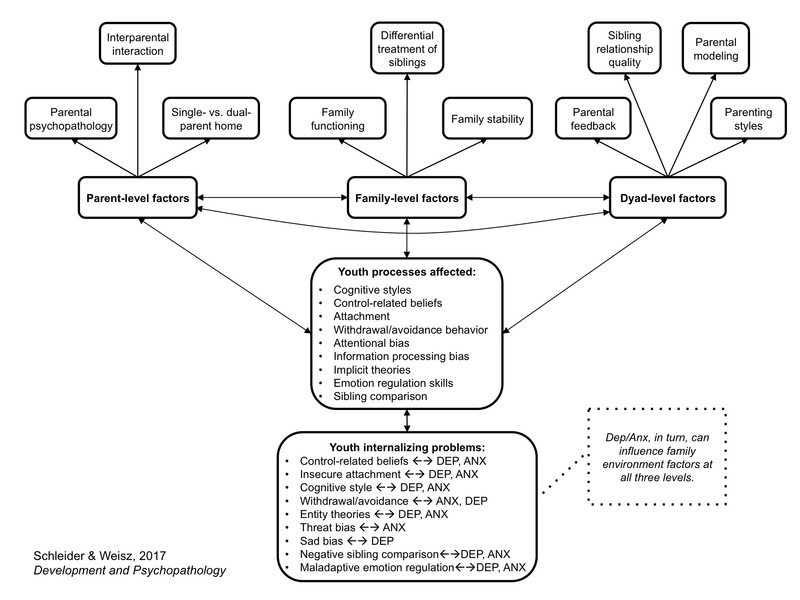 Familial stressors correlate with and predict mental health problems in offspring and unfavorable youth treatment responses. My research has explored how various family stressors—including parental mental illness, low family functioning, parental stress, and family structure—singly and jointly affect youth psychiatric problems and intervention outcomes. Together, this work has led us to develop a new theoretical model, the triadic model of family process, to help guide systematic identification of family-focused intervention strategies. This model outlines networks of parent-level (e.g. parental psychopathology), dyad-level (e.g. sibling conflict), and family-level risk factors (e.g. family stability) that may jointly shape youth processes underlying internalizing dysfunction (e.g., low perceived control). In several ongoing studies, we are applying this model in developing and evaluating brief, novel strategies for reducing youth internalizing distress and improving treatment retention and outcomes, targeting both youth- and parent-level factors.